Three million copies of satirical magazine Charlie Hebdo have reportedly sold out within an hour across Paris and just a week after the fatal shooting, the Internet is awash with ‘Je Suis Charlie’ merchandise. The new Charlie Hebdo edition, published Wednesday, was the first since the deadly attack on the outlet’s headquarters a week ago. Twelve people were killed in the shooting. People were lining up in the early morning at the newsstands, and when the issue sold out in an hour in the French capital and within several hours across the country, distributors announced they would print an additional 2 million copies to satisfy demand. A total of 300,000 copies also sold outside France, setting an absolute record for the French press, a French scientist and media historian told AFP. The issue is also selling on eBay, with the price for some paper copies of the magazine reaching as high as 100,000 euro. The first ever issue, of November 23, 1970, goes for up to 200,000 euro. 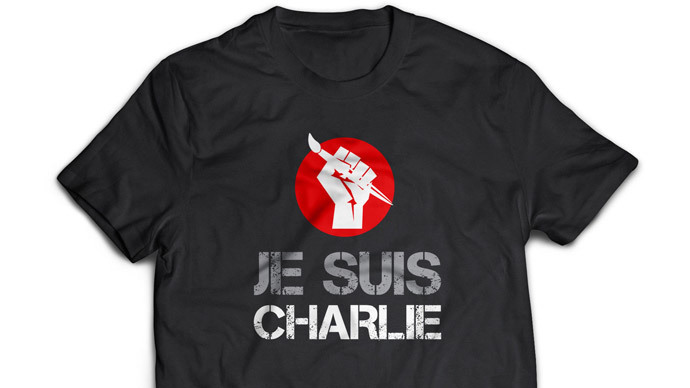 Meanwhile, thousands of T-shirts, caps, badges and other goods with “Je Suis Charlie” prints are being sold online. Some sellers have claimed that they are more focused on promoting the cause than profiting from the tragedy. “We have received a couple negative comments as well from a few French citizens who believe the American people are trying to profit from such tragedy, which was never our intent," she added. Another seller, RockWorldEast, reported huge sales of Charlie Hebdo merchandise: at least 1,800 T-shirts sold instead of the usual 300-600. Over 50 people have tried to register the trademark “Je Suis Charlie,” according to the Flemish-language media outlet DeMorgen. The artistic director of the French magazine Stylist, who created the slogan, has tweeted that he "regrets the commercial uses of it."